I found this on a link to a link to a link in one of the forums' posts. And yet despite the existence of Malta (which was nearly brought to its knees by the Axis air forces), the Axis moved several Divisions worth of equipment and personnel to N. Africa-- and they didn't go by land (although a lot went by air too). All this despite the Allied air and sea efforts to keep them out. I only used this as an example to show they were in fact capable of moving by sea. And had it not been for a change of leadership on the Commonwealth side, they might have reached the canal too. So folks who don't think they had the capability to move by sea should really look closely at the historical record-- they moved a great deal at sea. In reality, given the context of the times, they were just as good at moving forces at sea as most of the other European countries of the era (the exception being the UK, who'd been moving troops by sea for hundreds of years). 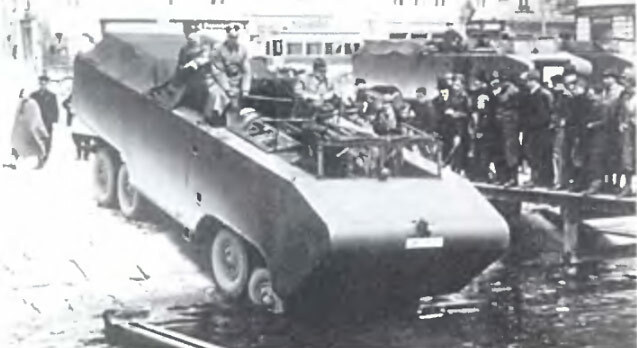 But it wasnt until the US entered the conflict in late 1941 that true "amphibious" warfare became a mater of course. As Eisenhower has said, it was the 2 1/2 ton truck, the Jeep, and the landing craft that truly won the war for the Allies. Although I’d suggest that moving troops across the Channel and keeping them and their horses supplied would have been a different proposition than doing so across the Med (with no or minimal horse-drawn transport). Sea conditions in the Channel are a lot more hostile to convoys of towed river barges. They lost 60% of their destroyers and 60% of their cruisers invading...Norway. 100s of km from the British coast. And that is losses, many of the ships were so damaged as to be still unavailable in the fall of the same year. They could not suppress the defenses of Malta enough to invade that in a year of trying. Against a few squadrons of Spits and Hurricanes. The almost manically aggressive Hitler saw it as a fantasy to invade Britain. The events of the war proved him right. Its the miracle of dunkirk that the brits left a secure beach and landed on a friendly beach, but people somehow think an enemy army can do the same move against an opposed beach and one of the largest navy's in the world. Amazing. With it... well now things are quite different. The British proved very nicely what capatal ships can do with out air cover in the Pacific. How well do you think all those british ships would have faired in the tight channel with german aircraft above them? Sure they may break up an invasion and sink a few transports, but at what cost to them? Not to mention those pesky U boats lurking around. Could the Royal Navy stop an invasion.. maybe. Could the Germans force the Royal Navy to turn tail and hide as they tired and land troops on England... Maybe. The one sure thing is the British Home Guard would not be able to hold those troops anywhere for very long at all. Remember they left all thier heavy weapons at Dunkirk awhile before. Hard to stop an armored attack with a rifle. The first phase of battle of Britain was pretty much a war of attrition between the two air forces, and while the Luftwaffe had high losses, the RAF was hard-pressed as well. It isn't far-fetched at all that Germany could have forced the RAF to weaken their presence in the south, and so was the Birtish perception back then as well. Maybe not enough for the Germans to achieve air superiority, but possibly enough of a relief for an amphibious assault? had been assembled in the ports chosen as starting point. The armies to be embarked on that fleet were already/ still standing in France, Belgium and the Netherlands. They were supposed to be dropped off barges closer to the coast, a bit like the Allied deep wading tanks on D-Day. 168 tanks of different marks were modified that way, 80 of which were later succesfully used to cross the river Bug on the first day of operatio Barbarossa. I’ve been looking at some of these, i think i could build the front of a barge and have a tauchpanzer begin wading to the beach in a dio while a sturmboots or two are approaching the beach. All justvmulling around in my head. Also, has anyone read about the Aegean Sea battles. I just finished a book about them where the British attempted to hold a chain of islands and the Germans actually used amphibious landings and took the islands. They weren’t good at it but they were successful to an extent. Hitler expected Britain to capitulate after Dunkirk and the “invasion” would actually have been an un-opposed, orderly and gradual ferrying over of occupation forces i.e. virtually bloodless (barring no doubt some guerrilla activity) as witnessed by the occupation of the Channel Islands. It would have been expressed as the British having “come to their senses” and “invited” the Germans to come over and “restore order”. The assembly of the Sealion amphibious operation served the purpose of maintaining pressure & kept a large number of now under-employed German forces busy for a couple of months while the Luftwaffe prepared the way for occupation by finishing off organised resistance. Some of the more practical vessels would likely have been used once the coast was literally clear. As has been said, the failure to secure control of the skies, and therefore the English Channel, exposed the bluff of a seaborne assault. Equally as crucial as the RAF’s performance was the bizarre phenomenon of the BEF’s crushing defeat being represented as a glittering victory, giving Churchill the necessary overwhelming support needed to continue resistance. As he might have said, never in the field of human conflict had such an ignominious rout of so many paved the way for the largest successful amphibious invasion of all. Only declassified recently, the British put together numerous special resistance units. They were small cells widely spread out that would make life very difficult for the invaders. Going back to the last successful invasions of England, Scotland and Wales it's not an easy place to conquer. Don't say Medieval versus modern operations are apples and oranges. Positional warfare, taking and holding land is very similar with artillery and air power being force multipliers but not changing the basic character of invading, taking and holding land. Then there's just what the Royal Navy could have done in the Channel against an invasion fleet. A little air cover can go a long way. And I ve always believed that an actual invasion of Britain would have prompted American intervention because of FDR and Winston's relationship. So just imagine US carriers flying off Wildcats covering the Royal Navy. FAA Martletts in North Africa regularly bested Me109's. I agree, this is not a worthy topic for modeling and discussion because it was a good idea, but because they actually concieved of it and planned for it. So the what would have it looked like is interesting. ... And, some of those materials were used in an "invasion" of sorts elsewhere -- in the Mediterranean during the movement of the Afrika Korps to Libya, where the Royal Navy was unable to effectively intervene (at first). So in reality, although it wasn't a truly amphibious operation, the Germans (along with their Italian allies) were able to move troops and equipment ashore effectively, across distances greater than the Channel. The Afrika Korps was put across the sea in bunches, and initially was no more than the 5th Panzer Regiment, and later the 15th "Light" Division. There is simply no parallel to the need for OKW to project probably 100x that number of soldiers onto the beaches of England. Hitler was told the invasion of Russia was madness, yet he did so anyway. We have no way of knowing how things might have gone differently if that plucky band of pilots, groundcrews, spotters, plotters, radar operators and others hadn't punched der Fuehrer squarely in the nose. I'm just skeptical of the notion of Germany having anything approaching transports from which to launch anything much at all. I have enjoyed all of the comments from the other Armorama readers! All of them were dead on right in the data. Just remember the entire Home Fleet would be on the way including all of their minesweepers. The Germans had few capital ships and maybe they would not want to loose them in the Channel. Please do not let me keep you from doing the diorama. I just wanted to point out the problems of Operation Sea Lion. Don’t worry it won’t keep me from doing the diorama. I’m just trying to come up with an idea of what i want to do and how to execute it best. I’ve really enjoyed all the feedback I’ve received on this. I’m hoping to start this in the near future. I'm just skeptical of the notion of Germany having anything approaching transports from which to launch anything much at all. As has been posted before, the fleet the Germans calculated they would need had been fully assembled (and more) by September 19,1940. They were massively relying on civilian vessels, a bit like operation dynamo just a few months earlier. Since it was part of the plan to conquer some ports intact, it probably played a lesser role that most of the vessels were not designed for amphibious landings. Getting the right number of vessels wasn't what troubled the Germans. In any case, I don't understand the debate about the worthiness of the subject, with all the E-series tanks and paper tanks and Luftwaffe 46 and what not being modelled. As has been posted before, the fleet the Germans calculated they would need had been fully assembled (and more) by September 19,1940. They were massively relying on civilian vessels, a bit like operation dynamo just a few months earlier. All the information I have seen was about using river barges and coastal lighters. What ships did the Germans have that could have carried Sturmboote? about which I could find very little; I knew nothing about this vehicle until I visited the Elite Modellbau site. While not perhaps as diverse as subsequent Allied specialised armour, the mix above and including this vehicle, is not uninteresting from not least, a What-If point of view. That looks like a German DUKW. Kinda cool looking though! I would suspect that the GermNs would of used the Landwasser vehicles more and would have had more ingenious designs. I do like the idea of that dml kit with the two LWS and the ferrying barge though! Two chassis for an 8x8 configuration of Einheitsdiesel were built, at least one, maybe both, were turned into amphibians. The project was not continued, maybe because the payload was only 4 tons. Thanks Robin; mind you, probably no better or worse than the British Terrapin.